Could this senseless Brookhaven parking lot shooting have been prevented? Gunfire reportedly erupted in the parking lot of a Brookhaven sports bar Sunday night, August 5, 2018, claiming the life of 21-year-old Kevin Carranza Acosta and leaving 42-year-old Javier Lira and 45-year-old Paula Guitun Romera injured. 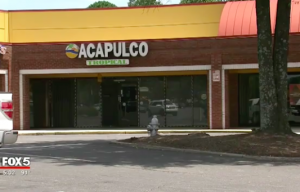 According to FOX 5, shots were fired from a vehicle outside a spots bar located “in the 3300 block of Buford Highway around 2 a.m.” Mr. Acosta tragically succumbed to fatal injuries. The AJC reports, Mr. Lira and Ms. Romera also suffered gunshot wounds. Their current conditions have not been released. The parking lot was apparently the subject of a prior shooting investigation in January 2017, per AJC reports. Was negligent security a factor in this Brookhaven sports bar shooting? Read Our Legal Take below to find out if Mr. Acosta’s family and the other victims of this shooting may have legal avenues for justice and claims for substantial compensation in Georgia. Bar and parking lot patrons have a right to feel safe and secure while on the premises. The Murray Law Firm questions the level of security provided at the subject property and whether this assault may have been prevented. What parking lot security measures, such as bright lighting, surveillance cameras and off-duty police, were in place to deter crime and protect Mr. Acosta, Mr. Lira and Ms. Romera at the time of the shooting? By law, property owners in Georgia are required to protect all those legally on the premises from any foreseeable harm. Should the facts of this matter reveal that the premises owner or management failed to provide adequate security, the family of Kevin Coransta Acosta may seek justice and elect to pursue legal claims for their loss. Additionally, Mr. Lira and Ms. Romera may pursue legal claims for their injuries. Finally, as Mr. Lira was apparently working at the time of the shooting, he may also be entitled to substantial workers’ compensation benefits.